So what is the value and nature of truth on earth? In asking this question with some research one realises that most people today are only equipped to run from it and have become inured to finding refuge in lies to protect the all important ego. Richard Bandler is one of the fathers of Neuro-Linguistic Programming (NLP). He studies the natural communication between people, the psychological affect of the experience and how to consciously steer it to make the results more desirable for the individual. In his practice he often uses ‘Mirroring‘. Mirroring is a natural mimicked response to another’s way of communication towards them. Although one of the subjects is unlikely to be aware of mirroring, the action effectively causes a more harmonious interaction between the two parties because the point is to appease and magnify what is natural to the other party. Only this, in Bandler’s system, is achieved consciously by one person, leaving the other vulnerable, unaware of the actions towards them as the unsuspecting participant.This is almost always to the advantage of the user of NLP. Yet this is oxymoronic for the fact that the unannounced study of the character can also be seen as manipulative and lying by omission. There is definitely an agenda. Yet there is truth in the actual reflection of the person evidenced by the harmonic result. Without external observation, we cannot easily know our selfdom, yet this reflection does appear subconsciously in subtle, peripheral ways within nature. Analogous to a rhythmic dance you can see the lovely tone is set and then nature follows. To give some perspective, let’s assume the other object in this choreographed harmony is not even a human being but any animated object. Most things in nature have a pulse that they move with. If a musical piece is being played there is an effort, between each participant or instrument to stay in harmony with the principle pulse. This compliments the whole to the output of synchronicity. Synchronised audible sounds resonate as harmony throughout the body but when music is arranged and recorded it becomes and remains a fixed composition locked in time. Because of the merging of the vibrations recorded, a final space-time event is set. This is set like a conversation from the past. You cannot change the words that have already been said. This for me makes mindfulness not a choice but a necessity. If you are on the same wave length then you will create those harmonious notes with another or a group that are consciously or subconsciously aware of this truth. If one or both in the conversation do not have the truth as a conductor or template (principle pulse) disharmony is the fruit and static is the result. When something is true it is reflected in every facet of life, the micro to the macro. Another example is dancing with a partner. To dance with somebody who is not on the guiding rhythm, again the principle pulse, would cause uncoordinated steps out of place and out of time. Please try to hold that thought because there is a point coming. Another example is dancing with a partner. To dance with somebody who is not on the guiding rhythm, again the principle pulse would cause uncoordinated steps that are out of place and out of time. Please try to hold that thought because there is a point coming. When some people relay the details of a conversation, which is also a recorded space-time event, they often (especially in courtrooms) express details that were either not present at the time of the conversation or were of no significance to the original dance of words. This could be because of the fear of the consequences of that unchangeable ‘Space-time event’ that has become history and set in stone. The outcome of what was once an actual event that allowed those involved at that creative moment, freedom to navigate its direction, could now mean undesirable results. The only way out of this scribed reality would be to actually go back in time and rearrange the details. Although the digital world provides for this, as corporeal beings this has not yet been achieved and has always been and remains a fantasy for those who step without mindfulness. 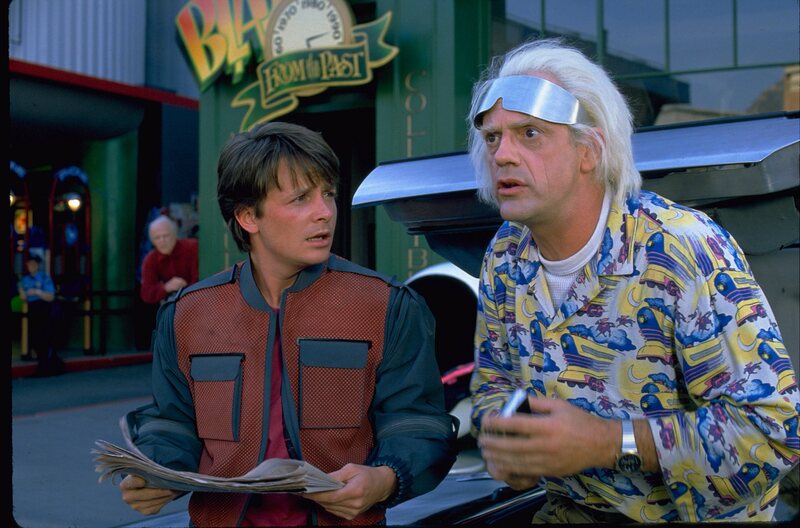 In the 1989 film “Back to the Future II,” Marty McFly travelled to Oct. 21, 2015. Even if the outcome of the debate and discussion highlights the unseen or bends the observer the ‘Truth doesn’t ever change’. In fact when a lie is told it doesn’t affect the truth, the lie just highlights the nature and psyche of the individual that expressed it. The fact that one would rather bend themselves around the truth than to see and engage in the reality which is in actuality a beautiful, pure dance of heaven’. Back to mirroring. In any interaction the object is to feel the primary vibration that is being emitted, when this is harmoniously in sync with the creative pattern of life then the object will add their expression of it, if that expression is equally felt by the object they will add too and so on. This is the lost dance that humans no longer enjoy. For whatever reason the distance felt between two people engaged in whatever the interaction is can be so huge that even when they dance they are on opposite sides of the floor because the lovely principle vibration was ignored by the ego. Divine mirroring is subtle and subconscious in its etheric form, when it becomes dense, earth bound and conscious it must be steered by a deeper consciousness or sent back up to the higher consciousness to be used harmoniously, because within our 3 dimensions it becomes vulnerable to corruption within the wrong hands. But then what are hands but the mind in action? Without this higher consciousness of morale each individual will scheme, and not always express their selfish agenda regardless of the listener’s lost choices. Nature in all of its unpredictable, wild, ferocious expression, always displays a wonderfully choreographed dance with its environment as the conductor. Each participant willing to be whatever, reflects the principle truth even if it plays the roll of the victim because beyond ego, the consciousness within would happily give its life and possessions for this trusted order to continue its natural path. With the freedom that humans have been awarded most have strayed and stayed absent from their immortal consciousness of harmony. The ego has suppressed and abused this for personal gain through perversion of the psyche, but the fixation on the now makes it impossible for it to be aware that this is not without consequences. Even when an individual decides to engage with honesty ready to talk and improvise with his fellow man with an empty, open mind, within a room full of people, most of the time he is sitting alone. The purity of truth becomes and ideal next to grossly overwhelming statistic of those there for the polar opposite, with minds full up with schemes and agendas. Once the conversation is completed and recorded in space the outcome should be mutually favourable but it is not. So if one feels injustice it’s probably for all of the reasons previously mentioned. Just as the record is set and all that can be permitted to happen is a display of psychic contortion to make the solid appear tenuous, the truth is on cosmic record and in the face of the matter that binds our exospheric laws to continue existence it will always be a perfect mirror to eventually crush that fabricated scene into dust. This is where religion struggles to appease the scientists mind and, as there is a common believe that there is a cap on what man can know, they take leave after the New Testament calling this thing, this truth, simply ‘Judgment’. It is where science stops with an inability to see morale in the automative reasoning which they may prefer to call ‘Algorithm’. Without ‘Truth’ you cannot make a balanced determination on anything. Truth is the steps in a dance with every other living organism on earth participating. Because of the desperate need to be accepted, human’s are watching this happening from the sidelines, observing the plant and animal kingdom hoping to find keys home and back to the meaning of their existence asking themselves ‘What went wrong’? The 21st century commenced with war and continues with war, disease, insecurity, injustice <—–(warning graphic!) and lost liberty all centering around fear, effectively being caused by lies which we are subconsciously aware of. The sources of what we call news are weaker than ever in the realm of truth, but rather than allow the outlet to die out, together our ego has created a social habit to feed it’s craving for recognition to be the first with info regardless of the credibility just to appear informed. We would rather nominate a male as woman of the year and place the truth on the back burner just to appear liberal and accepting. Until man injects a healthy dose of yin (nurture) energy out of the love of truth, at the foundation and at the price of relationships of all proportions it’ll be much of the same. He will remain at war in the bedroom, the boardroom and in the cosmos giving his real power over to the other souls of truth to appear like gods before him without effort or strain. Meanwhile each word of truth that resonates on to the earth will appear much more bitter to those who have found a home in lies….and ME? I will keep dancing with the mirror until I can see everybody looking at that beautiful reflection inside together with me. Mindful steps make a beautiful world. “YOU CANNOT DROWN A BUBBLE FOR ITS NATURE IS TO DANCE TO THE SURFACE ALONE OR AS MANY”. Dedicated to my dear friend Laura Borland and Amy Goodman, the Indigo’s, those who acknowledge 46 + 2 and those who truly feel it. Next > Jackson’s Way: The Christmas Top-Up Power Seminar!